During this past year, four senior scientists have taken up their Vallee Visiting Professorships and travelled to Stockholm, La Jolla, and Boston for a month of stimulating conversation, hands-on research, experience with new technology, and the time to re-energize away from their normal daily responsibilities. Host institutes warmly welcomed the VVPs, introduced them to colleagues and students, and arranged for them to give Vallee Lectures to their scientific communities. Naama Barkai (Weizman Institute of Science) journeyed from Israel to Boston last summer. Her plans were not connected to any specific project in her lab, but rather her goal was to discuss and interact with people as much as possible. She wanted to absorb ideas and have time to think things through outside the usual day-to-day work and commitments. Her three hosts were Andrew Murray in the Harvard University Systems Biology PhD Program in Cambridge, Aviv Regev at the Broad Institute and Marc Kirschner in the Department of Systems Biology at Harvard Medical School. She lectured both in Cambridge and at HMS but spent most of her time in stimulating and rewarding discussion with colleagues working on projects with close connections to her own research. Several collaborations have come out of these discussions, as well as new ways to look at old problems. Philip Cohen (Dundee University) enjoyed an intellectually stimulating and beautiful autumn month in Boston last year. He held interesting, wide-ranging and productive discussions with more than 40 members of the faculty of Harvard Medical School, MIT and MGH as well as hosting several mentoring lunches for post-doctoral fellows and graduates students. 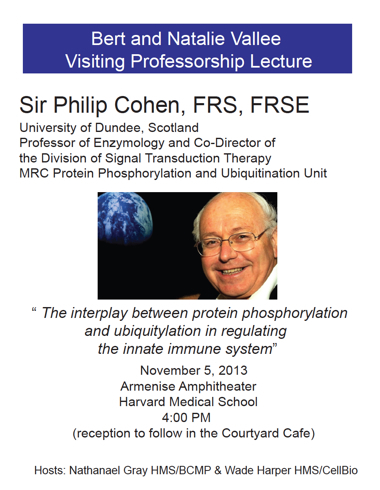 In addition to his Vallee Lecture at HMS on the interplay between protein phosphorylation and ubiquitylation in regulating the innate immune system, organized by his hosts Wade Harper and Nathanael Gray, he gave several other lectures in the Boston area and met with scientists in industry as well as academia. Walter Gehring (University of Basel) spent four weeks last summer at the Karolinska Institutet working with Rudolf Riger, Lars Terenius and other colleagues there on the continuation of a project to look at the question of how a Hox transcription factor finds its target genes among 18,000 genes in a living Drosophila cell. Besides conducting experiments, he gave four public lectures: one at Stockholm University, one at the University of Uppsala, and two at the Karolinska Institutet on the Homeobox story and on the evolution of eyes and photoperception. An extended period of working in close collaboration with colleagues at a different institute resulted in several discoveries and a future new collaboration. Arnold Levine (Institute for Advanced Study, Princeton) spent a month in the laboratory of Inder Verma at the Salk Institute. There he actively participated in the life of the institute, including weekly faculty lunches, and weekly laboratory meetings where graduates students and postdoctoral fellows discuss their work. 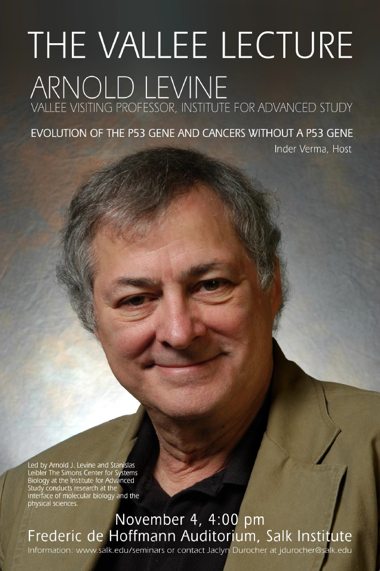 He gave a Vallee Lecture on his research into the evolution of the p53 gene and the evolution of cancers in the absence of the p53 gene, attended by faculty, students, and postdoctoral fellows. Rather than concentrate on one experiment or piece of research, Dr Levine chose to spend his time in numerous fruitful conversations with colleagues.